If you’re buying silver in the Silver Somalia Elephant program, you’ll find a lot of options available. It is one of the few silver bullion coins to offer fractional-weight investment-grade coins and it is also among the many silver bullion issues with distinctive gilded and colorized options available from authorized dealers. The 2019 1 oz Colorized Silver Somalia Elephant Coin is currently available to you for purchase online at Silver.com. Latest design in the African Elephant Series with colorized fields on reverse! Issued a face value of 100 Shillings (Somali). The reverse field features a new African elephant design. Silver Somalia Elephant coins have evolved significantly in recent years. Popular from their debut for Somalia in 2004, the coins have always featured a distinctive new design of the African elephant on the reverse. However, 2016 saw the increase of silver purity in the coins to .9999 and, more recently, the addition of the fractional weights. For these 2019 Colorized Silver Somalia Elephant Coins, a third-party authorized dealer has altered the visual appearance of the reverse design with the application of colorized lacquer. This does nothing to harm the silver value of the coin, but rather, increases the visual brilliance by adding real-world hues to the existing design from the Bavarian State Mint. 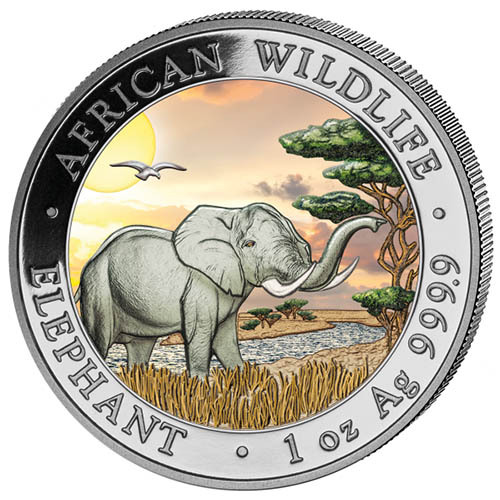 On the reverse of 2019 1 oz Colorized Silver Somalia Elephant Coin is the design of an African elephant using its trunk to reach into the trees for some foliage to eat. The grasses of the savanna stretch off into the distance along the banks of a river as a bird flies overhead as dusk begins to settle in over the landscape. The colorization on this side of the coin brings a brilliant gray to the elephant’s skin and bright white to its ivory tusks. The foliage of the tree is a rich green while the grasses of the savanna are a distinctive brown. The river’s blue waters move calmly away as the yellow sun paints the sky various shades of orange and yellow as a warm day comes to a close at dusk. 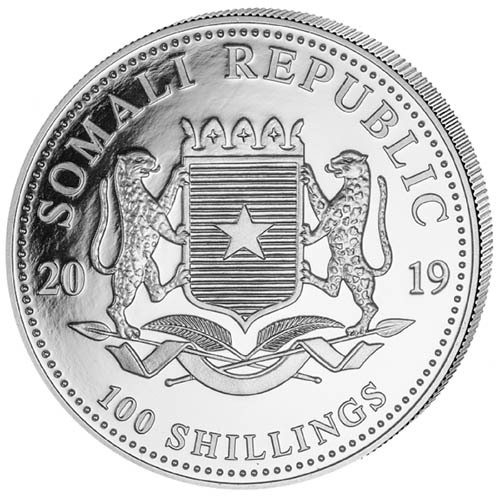 For the obverse of 2019 Colorized Silver Somalia Elephant coins, the Bavarian State Mint uses the coat of arms for the Somali Republic as the primary design. It includes the crowned shield of the nation with a background of horizontal lines and a single star in the middle. The shield is supported on either side by a leopard. We encourage Silver.com customers to call us at 888-989-7223 with questions. You can also reach out to us online through our live chat and email features.